The last regular figure in DC Universe Classics Wave 20 is my figure to review, and I think he might just be the best figure in the entire wave. If nothing else, this version of Green Arrow is one last taste of how good DC Classics could be. Noisy started out this week with his favorite figure in wave 20. But I’m doing the opposite and my reviews this week with my favorite figure. 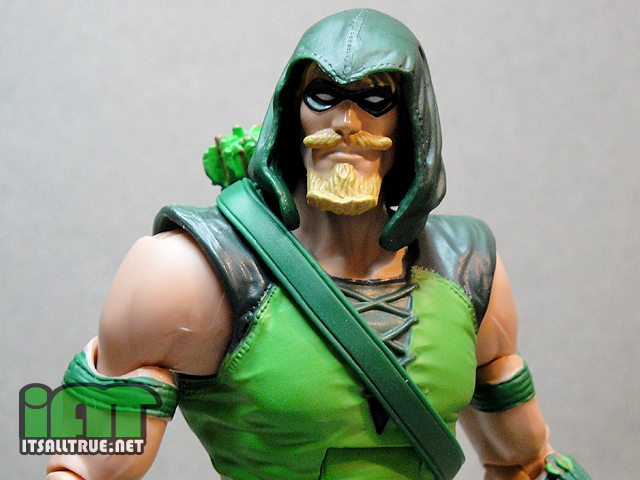 When news originally broke about Green Arrow receiving another DC Classics figure, I wasn’t overly happy about it. What little enthusiasm I did have was siphoned away when I learned this was also going to be the last wave. There were so many more characters to get to, why did one of the last figures have to be a redesign? But now that I actually have him in hand, I can say I was wrong about calling this figure a waste. Out of all of wave twenty, including Nekron, this is the one figure that symbolizes what I loved about the DC Classics line. He’s a super poseable figure, with a mostly new sculpt, of a character that strikes a chord with fans. Let’s start off with how the figure looks. 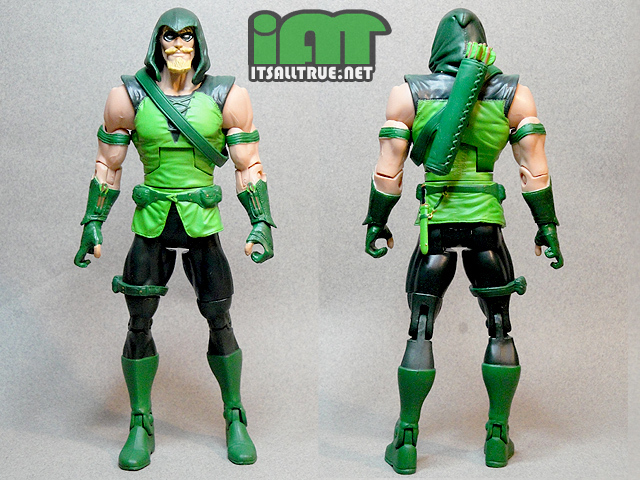 I combed through various online pictures of Green Arrow, trying to figure out exactly which costume this figure represents. It took me a while, but he seems to be from Brightest Day and the pre-DCnU relaunch with writer J.T. Krul. But even though this look only lasted a few issues, I think I prefer it over the “classic” look we got with the first GA figure. Mike Grell’s revamp of the costume is one of my favorites, and this figure harkens back to that design enough to be an adequate stand-in. Whereas Red Arrow almost completely reused the original Green Arrow body’s tooling, this version of GA is nearly an all new sculpt. The hood piece has some great wrinkled textures and stitching, while the head underneath has a crop of messed up hair hanging down over his forehead. His torso is also new, with more stitching running under his arm holes and the darker green areas. Also, on his back is a new round quiver that looks more natural than the giant square Super Powers one. GA also sports new biceps with arm bands, and a small pouch belt around his right thigh. 18 comments to DC Classics.com Nekron Week! If we can keep getting this kind of sculpting details going forward in the sub, I’l be a happy camper. While it’s debatable whether or not we needed this re-do fig (especially in the final wave), the execution was very well done, imho. Still haven’t gotten around to reading those last pre DCnU’d up issues, so I’ll also be viewing this as a Grell stand-in. Hilarious pics, btw. Totally in the spirit of the character. Now, bring on the scythe-less wonder! Yeah, I’m hoping the sub has this sort of quality. It’d definitely go a long way to making the line feel more worth the price. The JT Krul run wasnt too bad. This was the storyline where Ollie was exiled from Star City for the murder of Prometheus. He decided to hide in the massive star shaped forest that grew in the wake of the bomb that blew up the city. A pretty good start that really tied into Brightest Day. Still havent gotten that figure yet…but looking at the close up of the detail..i’m still gunna pick him up. Does his hood come off? It certainly looks like it does. It’s really too bad we couldn’t get Prometheus for this last wave, he would have fit in perfectly. Nah, the hood is glued on. I’m sure you could get it off if you really wanted to though. when you say he’s “super posable,” there’s a part of my brain that says that term should be reserved for the dcucs that had double hinge elbows and/or knees… or rocker ankles. he’s got standard articulation for the later part of the line, but he’s not “super posable” within the context of his line. Yeah, I know what you mean. Compared to any of my Japanese figures, DCUC seems like it’s just basic. This is almost standard articulation these days, so I guess word “super” should probably be taken out. I wonder what 5 POA would be considered? Sub-articulated maybe? sparsely articulated. or maybe nominally articulated… but yeah, sorry if that sounded bitchy, it wasn’t intended that way. it’s just that, he’s not even “average” for a dcuc, considering the lack of rocker ankles… and they ruined their own standard when they introduced the double elbows and knees. so i guess, as an exception to the rule, GA here has “archer wrists” but that doesn’t really get him to the realm of “super” for the line. It’s a great sculpt, no doubt, but the choice of colors leaves me a bit off. (no pun intended.) The lime(?) color of the tunic is too light and they could have gone a shade darker, imo. Two other demerits for mine is the arrow is too thin and I don’t think I got one among the two pair of archers that didn’t have stress marks from the package. Why two pair? because the first GA I got is cracked open on both sides of the lower torso. It took me a month to find a second GA and it hasn’t cracked yet. Meanwhile, I’ll still be holding out hope for a GA Connor…eventually…. We’ll probably get a Connor Hawke GA right after we get a Wally West Flash. Both of those are on the list of characters that DC no longer wishes to acknowledge as ever existing. I passed on this guy today because of the stress on the arrow in package. I have a crazy expectation that I will be the one to break my toys after I open them instead of finding them already broken. w17 OL Lex was already broken for me as well. ha ha that last pic is awesome!!! Great work as usual Vault! 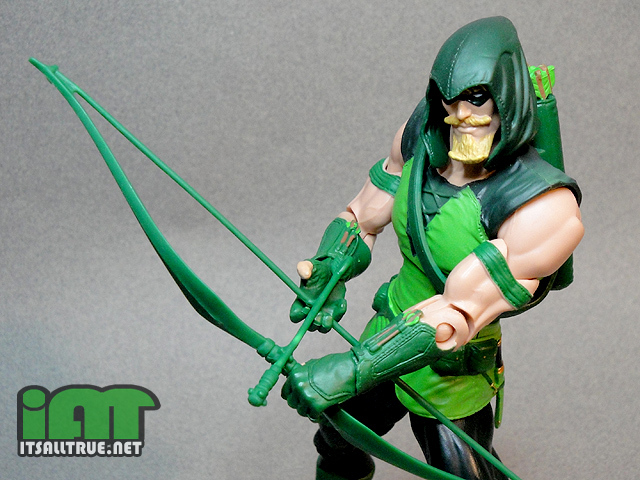 I didn’t even notice all the new sculpting when I opened this Green Arrow. Thanks for pointing that out. I love the figure, but that bow just pisses me off. Why give him great wrists, when he can’t use them with his only accessory? I particularly enjoy that pic of him where he’s like, “Yeah, b*tches. I’m too cool to appear in your photo.” Like it’s an ad for his bow and he’s just “showing off the merchandise”. That has to be in quotes because he would say it like a douche and since I don’t have “d-bag voice” punctuation, quotes will have to do. I hate those tiny arrows. I should clarify: I hate those tiny arrows on his bow and in his quiver. The ones on his wrist look cool. Great review. This toy is a great example of how good DCUC can be when they put in the effort. It’s toys like this one that I cherry pick from the line.